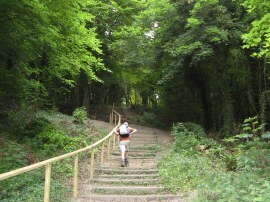 I did this, the 5th and final stage of the Vanguard Way with Chris on 13th August 2010. The rest of the group had finished the walk way back in early March but I had missed it at the time because my car wouldn't start on a cold frosty morning. This time around I had a very easy drive down to Newhaven where I met up with Chris, the roads being remarkably clear despite having to leave London in the rush hour, and we were both in Chalvington for the start of the walk by 9:30. 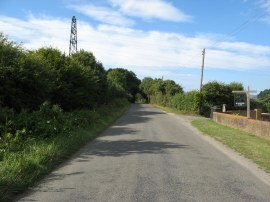 The route of the Vanguard Way heads along a straight stretch of road, photo 1, before turning right into Langtye Lane. 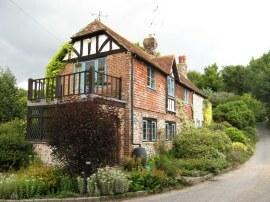 The route heads past a house before taking a footpath on the left that heads alongside a corner of a field and over a stile into another field. Here the route heads straight across the field but as it was in the process of being ploughed we ended up walking round the field edges to reach the gap through the hedge into the next field. 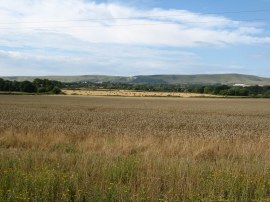 Ahead of us there were decent views across to the South Downs which were looming large on the horizon. 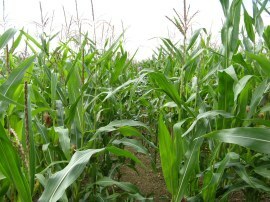 The route crosses another small section of field before heading between the buildings of Mays Farm where we had to climb over two locked farm gates on our way to the next field where the path headed diagonally through a very tall crop of maize, photo 3. Thankfully the weather was dry at this point otherwise we would have got soaked as we pushed through the densely grown crop. We then crossed over another small field to join a track by Ludlay House. Just past a building on the right the route heads to the right along a footpath that heads towards the backs of some houses which the route then follows down to join a road by Berwick Station, photo 4. 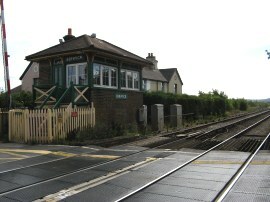 Having crossed over the railway lines the route takes a footpath on the right which heads up besides a small factory unit into a field. Here the path headed across another field of maize although we missed the path and headed along the field edge to the corner of the field where we turned left to link up with the correct route of the path as it left the field to join a broad grassy track that runs down to Stonery Farm. Here the Vanguard Way turns to the left along the driveway to the farm to reach Common Lane. 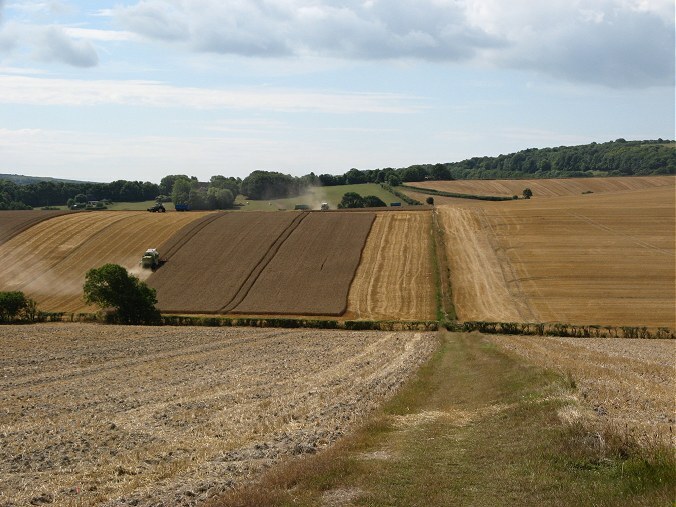 Crossing the road the route then heads diagonally across five fields of various shapes and sizes before turning half fight along a field edge path before the route crosses one final field to reach the A27. Here the route turns to the left before crossing the road and heading up a road named "The Village" which leads to Berwick Village. Opposite the Cricketers Arms pub the route heads along a track on the left before turning to the right by a very over grown pond. This path heads up alongside a house and then over a patch of open ground to reach St Michael and All Angels Church, photo 5, where we stopped for a short snack break. Leaving the church the path then heads alongside a couple of rolling wheat fields, photo 6, which were in the process of being harvested. The path continues straight ahead, becoming a track which leads on to West Street on the outskirts of Alfriston. 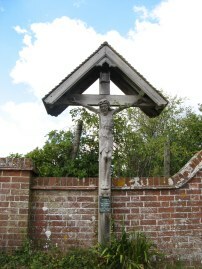 Heading down West Street into the village, the route passes a carved wooded cross, photo 7, that was erected at the side of the road in 1919 by Alice Gregory. 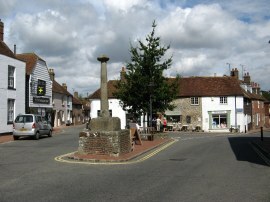 Reaching the centre of Alfriston, photo 8, we paid a quick visit to the Village Stores, a very pleasant traditional shop with a very enticing delicatessen attached. The ham and chicken pie looked delicious but I already had a large packed lunch so did not buy any extra supplies, however tempting they looked. Leaving Alfriston we linked up with the route of the South Downs Way as it heads down River Lane to reach the Cuckmere River although according to the Vanguard Way guide we headed briefly off course at this point as the Vanguard way takes a different route through the village down to the river and the Plonk Bridge, photo 9. Crossing over the river we turned to the right following the floodbank downstream. 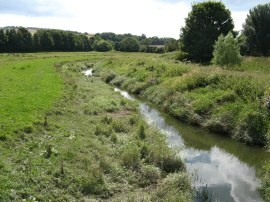 The river bank, photo 10, is followed for just over a mile before the route joins a footpath on the left that heads uphill away from the river to the hamlet of Litlington. Here the Vanguard Way turns to the right along the road for a short distance before heading briefly up a track on the left. A few yards up the track the route joins a footpath on the right which starts heading quite steeply uphill away from the village to reach a large, open hill top field. 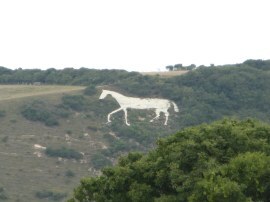 Away to our right we could see the White Horse, photo 11, on the other side of the valley. The day had started quite bright and sunny but showers had been predicted and as we were crossing over the hill and the clouds from the North which had been steadily catching us up finally reached us although it still looked bright ahead. 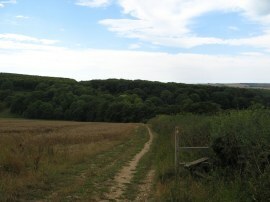 Once over the hill top the path then descends down to enter Friston Woods, photo 12. At the bottom of the hill the route joins a track that bends round to the left, skirting a large house before once again climbing quite steeply uphill through the trees of Friston Forest. Once at the top of the hill the route continues ahead on a broad track through the trees before heading round to the left, following the waymarked route of the South Downs Way. Reaching a T junction the route heads downhill to the right to join a tarmac road in the village of Westdean, passing the very attractive cottage in photo 13. 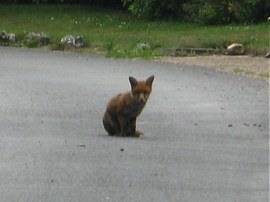 The route heads across The Lane, where there was a fox sitting in the middle of the road, photo 14, to join a track that continues ahead up a long steep flight of steps, photo 15. 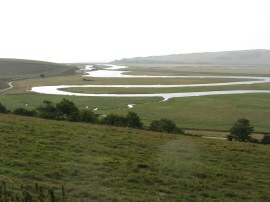 The path levels out and heads through the trees to reach a wall that borders an open field above Exceat with great views across the meanders of the Cuckmere River, photo 16, as it heads out to the sea. Unfortunately just as we arrived at this point it started pouring down with rain which rather ruined the clarity of view which would have been spectacular in the earlier sunshine. We headed quickly down the hillside to the visitors centre at Exceat where we stopped for our lunch break at a picnic table in the car park which was under some dense trees. While gloomy, they made a good job of keeping the rain off while we ate and waited for the shower to finish. Leaving the visitors centre we headed to the right along the A259 to cross the Exceat Bridge before taking a footpath on the left that runs alongside the Cuckmere River, photo 17, by the Golden Galleon pub. 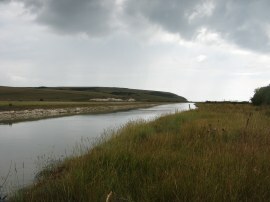 This path soon leaves the river, following the edge of the hills on the right, round the edge of the floodplain to reach the beach at Cuckmere Haven, photo 18. 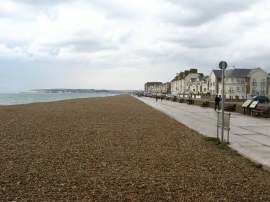 Leaving the beach the route heads to the right past some cottages before bearing to the left along a grassy path that starts ascending up Seaford Head. 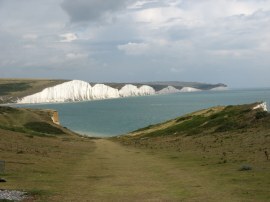 As we headed steadily uphill there were good views behind us to the Seven Sisters, photo 19. 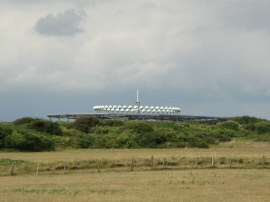 Approaching the summit of the hill we passed the Seaford Radio Navigation beacon which was located in a golf course to the right of the path, photo 20. 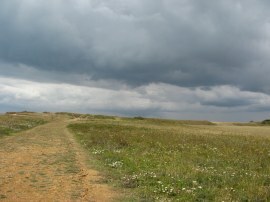 As we crossed over Seaford Head, photo 21, the skies had been steadily darkening once again and in the distance we could see one particularly heavy shower, obliterating the view in a swathe of grey although luckily it was not heading in our direction. 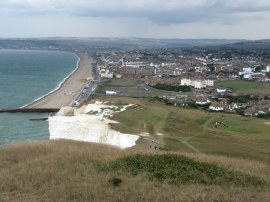 From the top of the hill the path descends quite steeply down to Seaford, photo 22, and as we were heading downhill it started raining again. This time with no convenient cover we were forced to stop and put on our waterproof jackets although we both decided not to bother with our waterproof over-trousers. From the top of the hill we had been able to briefly see Brighton but it soon disappeared from view. Reaching the foot of the hill we headed over to join the sea front promenade, photo 23, which was more or less deserted, despite it being mid August and the peak holiday season. 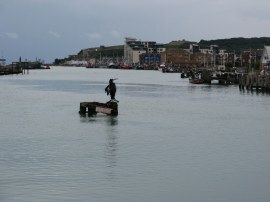 The rain soon stopped and although my trousers had got wet they soon dried off in the strong head wind that we now encountered as we made our way along the promenade towards Newhaven. The route passes a Martello Tower which is now a small museum, next to which were some handy public toilets before continuing on alongside Marine Drive. 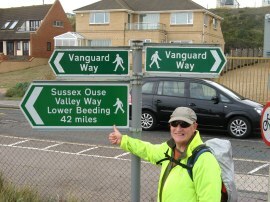 Where this bends to the right the Vanguard Way continues ahead passing a sign that marks the start (or end) of the Sussex Ouse Valley Way, photo 24, a path that Chris has already walked. A short distance further, just past the Newhaven and Seaford sailing club the route bears to the right, finally leaving the concrete promenade path to join a narrow path along the top of a seawall that runs just inland from the beach. This path is followed to reach the site of the now derelict Newhaven Tide Mill where there once was a mill and housing for 100 workers. 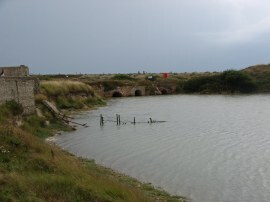 Now all that remains are a few intricate flint walls and the tidal inlet sluices to the mill, photo 25. Here the route crosses a track and heads along a rather overgrown section of path that runs alongside Mill Creek to join a path squeezed between the creek and railway lines. Close to the track the path was so overgrown that for a while I was unsure if it was actually the correct route. 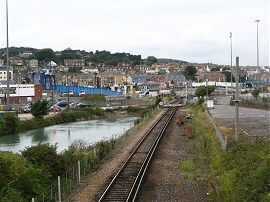 The route then takes a concrete bridge over the railway lines which opened up views both back towards Seaford Head, photo 26, and into Newhaven, photo 27. The whole area had a very run down feel about and all the buildings seemed like they had seen better days. Once over the rail bridge the path soon joins Beach Road where there was one final Vanguard Way sign, the official end of the route being a few yards further up the road at the Newhaven Harbour Station. 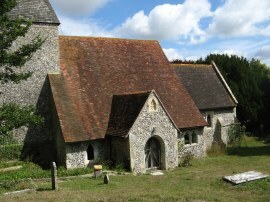 At this point we had walked 15.0 miles from our start point at Chalvington. 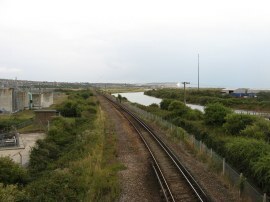 Our car was parked on the other side of the River Ouse so we then headed up through the rather dreary industrial estate that lines Beach Road, which briefly becomes Clifton Road and then Railway Road to reach the A259 Drove Road by Newhaven Town station. Here we turned to the left to cross over the swing bridge that takes the A259 over the River Ouse before heading down some steps to Chapel Street where we had parked. Reaching the car we had walked 15.7 miles. I was really pleased to have finally finished this walk and despite the grey skies all around we had only got caught in two brief showers all day. The final mile or so into Newhaven was rather dull but I quite like walking through these old industrial areas which are likely to be demolished at some point to be replaced by characterless water front housing. 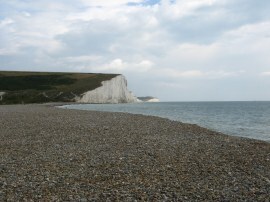 Apart from that it had been a cracking walk over fields to the South Downs and then down to Exceat and over Seaford Head with a costal walk thrown in as well, all in all very enjoyable and varied walking with great views en route. 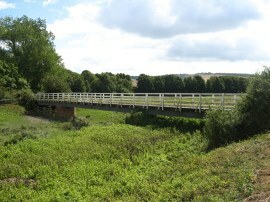 I have uploaded the route of the walk which can be accessed here Vanguard Way 5 Route. Please note I still have to write up the pages for stages 3 and 4 of this walk!